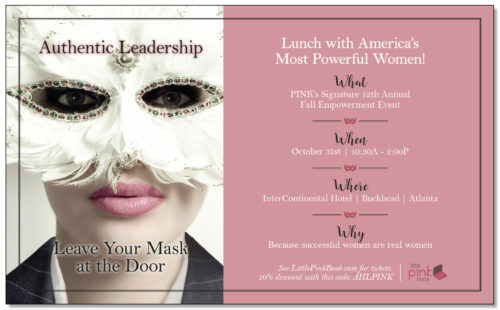 ATLANTA (September 15, 2016) – Join the women’s business advocate, LittlePINKBook.com, which brings together a diverse group of top business leaders in highly competitive industries, to share the real, compelling and deeply personal stories behind their rise in American business and what other women can do to dramatically advance in their careers and improve their lives. These panelists will discuss where they are, what they’ve learned and what they had to give up to earn the top job. The lunch event takes place on Monday, October 31, from 10:30 a.m. to 2:00 p.m. at the InterContinental hotel in Buckhead, Atlanta. In addition to the panel dialogue, an audience of more than 350 high potential women will have the chance to network with likeminded individuals prior to lunch. Similar networking opportunities at previous PINK events have resulted in new friendships, job offers, and multi-million-dollar business deals. 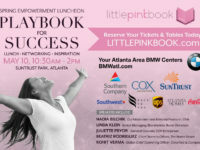 Sponsors that make this event possible include: The Coca-Cola Company, Dunkin’ Brands, Southern Company, Mighty Leaf Tea, The Home Depot, Greenberg Traurig, Randstad USA and Atlanta Homes & Lifestyles magazine. All raffle proceeds will support the Alma G. Davis Foundation to help take the mask off domestic violence. 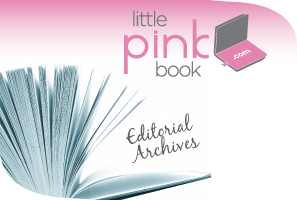 Little PINK Book is the top events and digital platform for America’s 72 million motivated, bright working women who are eager to advance their careers and improve their lives. Events, social media, videos, blogs, monthly newsletters and more, provide the guidance of a mentor, career coach, financial advisor, entrepreneurial expert and office style maven. See littlepinkbook.com for more.